For people with obstructive sleep apnea, gravity does not work to their advantage. Some people who sleep on their backs experience tissue or fatty deposits in the neck and throat that cause sleep apnea by falling back and covering the breathing passages. This stops the person from being able to breathe as they should, causing pauses in breathing until the brain starts the person awake to get them to breathe again. People with mild sleep apnea may experience between 5 and 15 episodes per hour, people with mid-range sleep apnea may experience between 15 and 30 episodes per hour, and people with severe sleep apnea experience 30 or more breathing episodes per hour when they are sleeping. This type of interruption in breathing can cause of a variety of serious problems that can be dangerous for the health. Because of the lack of oxygen that comes from breathing less often, the heart has to work harder to provide oxygen to the brain and the rest of the body. This can be the cause of chronic high blood pressure, heart disease, enlarged heart, atrial fibrillation (irregular heartbeat), and stroke. Obstructive sleep apnea has also been related to metabolic syndrome, thyroid problems, obesity, diabetes, depression, ADHD, and more. Some of the conditions related to sleep apnea can be responsible for premature death. Most experts agree that people who sleep on their backs are more likely to have sleep apnea episodes due to the way that airways have a tendency to close in this position. While sleeping on the stomach is an option, this is not ideal as this position requires the head and neck to be extended which can cause cramping or pinching of nerves. Most people find that the best sleeping position for sleep apnea is sleeping on the side. This keeps the airways open and allows the person to sleep comfortably. For people who like sleeping on their backs, changing sleeping positions may be difficult as these types of habits are deeply ingrained. It may take some time to change the habits your body and brain have become so accustomed to in sleeping, but you can re-teach yourself to sleep on your side with some effort and possibly by changing the pillow that you use. While the treatment for sleep apnea will differ depending on the cause, many people find that sleeping with a specific pillow is useful in allowing them to sleep in a position that lessens the number of breathing episodes that happen during the night. If a person has been working to use positional therapy to mitigate the effects of sleep apnea and improve breathing during sleep, a side-sleeping pillow will be the best option. Someone who sleeps on their side needs a different pillow that someone who sleeps on their back as they need firmer support for their shoulders and neck. In addition, people who need to use a CPAP (Continuous Positive Airway Pressure) machine, often need a specialized pillow to help keep the mask part of the machine well-placed on the face. This specialized memory foam pillow offers all the support a person needs for their neck and head when sleeping on the side. 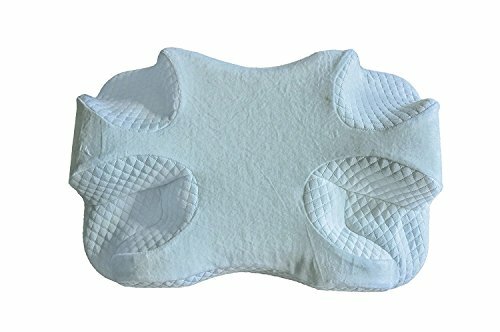 Offering a full facial cradle and 12 degree shoulder cradle, this hypo-allergenic pillow is made of rayon that is sourced from bamboo. One critical feature for people with sleep apnea is the lateral channels in the top surface of the memory foam that allow for maximization of airflow that helps to improve breathing and minimize problems with snoring. 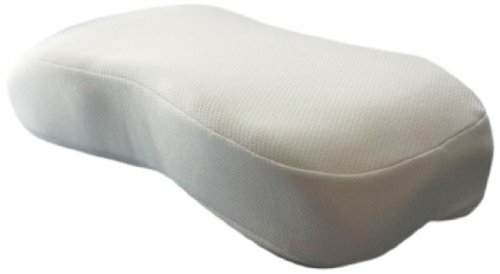 This high quality foam pillow by EnduriMed reduces the pressure placed on the face by the breathing mask. In addition, it offers two thickness options for head and neck rests while continuing to provide the most comfortable position no matter the size of the person. Other people may find that sleep apnea symptoms may be reduced when using a wedge that is placed on the mattress that helps to prop up the upper body and may reduce blockage of breathing passages. Combined with weight loss, healthy eating, exercise, and activity, your sleep apnea may be reduced or even cured with some minor adjustments to your lifestyle. Even though mild cases of sleep apnea may be minimized by natural methods, this sleeping disorder is a dangerous condition that should be handled under the supervision of a medical professional. If you or someone in your household is exhibiting some of the symptoms and signs of sleep apnea, it is crucial to contact a doctor in order to get a diagnosis. Sleep apnea can have a variety of causes and you need to makes sure that yours is treated appropriately based on the underlying reason for it. Sleep apnea is a serious condition but also one that can have a positive prognosis if caught early and treated appropriately. Your doctor will help you (or refer you to someone who will) determine the cause and best course of treatment so that you can start sleeping well again, and get back to a normal lifestyle.